We’d like to thank Jeff Burgher for sharing the following story. I was at the Ryder Cup this past year on Sunday at Hazeltine. My day started by shaking Michael Jordan’s hand, as he was walking to the first tee to watch day three get underway. Hard to believe it could get better a couple hours later. On a par three in the middle of the course, I was standing by the ropes waiting for Jordan Spieth to hit his tee shot. This guy cuts in front of me inside the ropes, then ducks back under the ropes and heads down in between two other fairways. 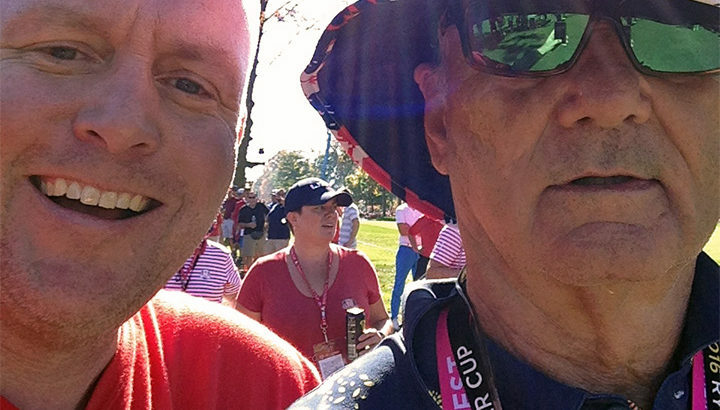 My buddy says, “that was Bill Murray”. I take off running after him, as he is nearly a football field away. When I catch up to him roaming about by himself, I put my arm around him and ask him if I could have a quick shot. He replies, “I normally only have shots after I’ve had a few drinks.” I snap a quick selfie and gave him a pat on the back. My only regret is I should have kept walking with him; who knows what the day would have brought. Jordan and Murray in one day. Crazy!